"...a frenzy of gospel halls and hallelujahs!.." "If it's not on tv, it's not real"
Here's a story about a forthcoming update to Jamie Stuart's "A Scots Gospel", which is a paraphrase of the Bible into Glasgow Scots. I haven't seen the earlier video version, but I do have a copy of the book somewhere roon aboot. Funny enough it was an earlier James Stuart who commissioned his own Authorised Version of the Bible in 1604, which was published in 1611. The DVD will include a strange array of Scottish celebs, including Sir Alex Ferguson, Billy Connolly, Sean Connery, David Tennant and Duncan Bannatyne. It's common for conservative Ulster Prods to jump to criticism of a project like this, and I'm sure some of you will, but read the Evening Times interview linked above and it'll give you a fuller picture than this short post can. Jamie was interviewed in the Church of Scotland magazine "Life and Work" in the May 2008 edition, and came across really well. I hope I'm doing creative stuff like this when I'm 89. > Click here to buy the book "A Glasgow Bible"
> Click here to buy the CD "A Glasgow Bible"
Norman Wilkinson was one of the greatest artists of his generation, which speaks volumes for the vision of the UTDA. They weren't satisfied with three-tenders-and-the-cheapest -price-from-the-wee-man-down-the-road-gets-the-job-and-by-the-way-we'll-tell-him-what-to-do-anyway-even-if-he-knows-better. They wanted the best and they went out and got him. "Ulster for Health" is a message you don't hear too often these days! 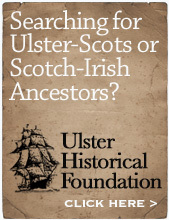 Ulster for hypochondria is more likely. This poster for the Scottish ferry operator MacBrayne plays the highland stereotype very well, but what I really like about it is the blue flag that looks like a hybrid Cross of St Andrew and Cross of St Patrick. Caledonian MacBrayne still run many ferry routes along the west of Scotland, and also the Ballycastle to Rathlin ferry. Mind you, it looks like a band of hard as nails armed lowland Covenanters are creeping up the hill to take out the "Highland Host"! These two are in our hallway - massive posters about 4 1/2 feet wide. These and many more (both originals and good quality prints) are available to buy online here. Some of you know that Graeme and I are out singin' again, this time as a simple "brother duet" style two piece. I'm just back in from a really special night at Greenwell Street Presbyterian Church in Ards, where we played a 45 minute set. It's hard to describe just how welcome we were made, the real sense of connection in the room between our singing and the audience, and the virtual stampede at the end for the box of leaflets (Hamilton & Montgomery, Covenanters and Scots in Ulster surnames). I even met two women who were wee girls that took part in the 1948 Presbyterian Pageant! And another lady, Marie Montgomery, who used to live next door to Newtownards Priory and who played in it as a wee girl when it was still open to the public, and when it had manicured ornamental gardens inside it. Hearing the people (I'd guess about 200 - 250) joining in with our singing was really special. Then last Sunday morning we were at Willowfield Parish Church in Belfast and played 4 songs - again a wonderful response from the people, and they want us back next month! They even served us a sausage bap and cup of tea for breakfast, and playing some of the old hymns went down really well - two men told us it was like being back in the City Mission when they were wee lads! Another man gave me an extra verse for "Running Over". It's a humbling privilege and joy to get the opportunity to take that three-part message out to oor ain folk, folk who have a massive appetite for their ain story, having been starved of it for so many years. (I was amazed when Phil himself commented on the previous post I had about the series a few weeks ago, so I hope he picks up on these positive comments. One of the programme's researchers has also been in touch with me, passing on some great information about other evangelical Scottish music, and a brilliant article about the concertina in Scottish evangelical outreach). Any criticism is very minimal - but sadly the programme avoids the Scots language hymns and songs outside of the mainline Kirk, the writers like Seth Sykes and so on, who DID rework Scottish folk tunes with gospel lyrics in the first half of the 20th century. It also misses out most of the smaller Protestant denominations and organisations, like the Faith Mission. Pardon the bold caps, but - THIS IS THE BEST PIECE OF TELEVISION I HAVE SEEN IN DONKEYS YEARS!. Seriously, watch it while it's still online. On Radio Ulster this morning, there was a clip of an Australian Prime Minister Kevin Rudd speaking at the memorial service to the people who died in the recent bush fires. He quoted Martin Luther when describing the steely bravery of the Aussie firemen - "Here I stand, I can do no other". Later that evening there will be "An Evening of Psalm Singing - Christ and His Suffering Church", also at the Town Hall, beginning at 7.30pm. Admission free - singing will be led by the Northern Presbytery Choir. Two years before massive spiritual revival swept across Britain and America in 1859, there was a massive economic collapse. The Panic of 1857 followed a recession in 1856, with banks and businesses failing in the US. 5000 American businesses collapsed in one year - and the effects soon spread to Europe. Just prior to the Panic, there had been the famous Californian Gold Rush - get rich quick schemes, rising wages and retail prices fuelling what looked like unprecedented prosperity and affluence. Then overseas investors started to withdraw from American banks, the global value of the dollar went down, property and land prices collapsed - and to top it all a huge shipment of US gold bullion was lost at sea. Google it for yourself. There's nothing new under the sun. About 20 years ago I heard Prof John Lennox of Oxford University speaking in a masterful series of lectures on the subject - I still have the audio tapes in the roofspace somewhere. Like with the climate debate in the blog post immediately below, the Norn Iron MSM (mainstream media) revel in pitching an academic or scientist against a politician - just as they did on Radio Ulster this morning on the Ulster Museum thing - and all stoked up by the presenter whose job often seems to be to create an on-air storm, to generate heat but not necessarily light. With this approach, the subtle subtext to the general public is one of fresh voice versus not yer man again / intelligent person versus professional mouthpiece / softly spoken versus one of those people that usually rants. 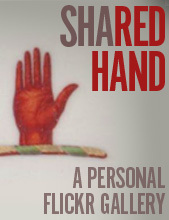 Hardly the standard of presentation that the subject often requires, or that the public deserves. What we hardly ever get at all is well informed discussion and debate. However, at the end of last year, John Lennox debated Richard Dawkins in the USA (an audio clip of the complete discussion is on Google Video here). John Lennox's website is an excellent source of some short video clips where he tackles some of the biggest ethical issues of our age. Take a few minutes and have a look for yourself. And he has the added bonus of not having lost his Ulster accent! And if you want to find out a bit about how a wee Belfast Presbyterian is to blame for Darwin's theory, this website by Rev Keith Drury of May St Presbyterian Church will tell you the story - click here for the PDF. PS - I forgot to say that the ship on which Darwin made his famous trip to the Galapagos Islands was yet another Belfast man - Captain Robert Fitzroy (1805-1865). More info about Fitzroy is available at the top of the Google rankings here - it'll download a PDF. I hear that today his Stormont committee has passed a vote of no confidence in him, and that according to the front page of tonight's Belfast Telegraph, his position is now under real pressure. The weird thing is, that on the letters page of the same paper is a letter entitled "Sammy's right, man is not responsible for global warming", written by Terry Jackson, founder of the Energy Group at the Institute of Physics in London. Immediately underneath that letter is another one, this time from Scotland, entitled "The Climate Change Scam". Jackson's letter ends: "Friends of the Earth and the Greens can attack Sammy Wilson as much as they like, but his analysis on climate change is dead right and they are wrong". The letter from Scotland quotes a Professor James Lovelock who said "it is an elaborate scam in the interests of a few nations whose economies are enriched in the short term by the sale of wind turbines, biofuel plants and other green-sounding energy equipment". Sammy's big enough to look after himself, and if this comment piece from the Daily Telegraph is anything to go by, there are plenty of people out there who agree with him. What shocks me is how difficult it has become in today's society to hold a different opinion, to challenge orthodoxy, to question "accepted wisdom". If anyone speaks out - on almost any issue - they are immediately flamed by the rest of society and the myriad of media producers who struggle to fill airtime, column inches and web pages. "...her first journeys (from Millisle) were by horse and sidecar along the coast road to her grandmother's house at Portaferry. Among the treasures in that house was a sampler made by her great-great-grandmother, Jane Dalzell... a General Dalzell was a friend of Claverhouse, who persecuted the Covenanters. My father's people were Covenanters in the Lowlands of Scotland and they fled to the North of Ireland because of these persecutors. When my mother married my father, it was as if persecutor and persecuted were united..."
Charlie Louvin "Sings Murder Ballads and Disaster Songs"
I had a good response to the recent Hillbilly Murder Ballads post, so here's another. Charlie Louvin, the surviving half of the Louvin Brothers (the best brother duet group of all time), is 82. Just before Christmas he released an album entitled Sings Murder Ballads and Disaster Songs. The first Louvin Brothers album was called Tragic Songs of Life (1956), so the new one carries on the proud tradition. Each track has a small sound clip on the Amazon.com page - listen to "Down with the Old Canoe" - it's a tale of Belfast's own Titanic which sank nearly 100 years ago. The other side of Charlie Louvin can be heard on the other album he released in 2008 - Steps to Heaven, where he sings with a black gospel choir and band - on Precious Lord he really sounds like Thomas Dorsey. Back in 2007 he was nominated for a Grammy with this album - check out his version of the old Jimmie Rodgers song "Waiting For A Train" - it has a great country bluesy swing. I can't remember whose quote that is, but it was proved to me in glorious HD ready technicolour last night. I took Jacob to a cold, snowy Ibrox to watch Rangers playing AC Milan - a friend of mine had organised both tickets and hotel for us, and we negotiated a day off school with Jacob's P6 teacher. AC Milan have a dazzling array of world-famous players in their squad - Beckham, Ronaldinho, Kaka, Inzaghi, Shevchenko etc - so last night was a big glamour match which brought a new audience of celebrity-watchers never mind football fans to the match. Sitting just behind us were two brothers - about 14 and 6 - and the wee one had clearly never been to a real football match before. The wee one was asking all sorts of very loud and (for his big brother) embarrassing questions like "who are these two teams? ", "are Rangers the ones in red and black? ", "which team does Ronaldinho play for?". The older brother's answers got snappier and angrier as time went on. "Hey Davie, why's there nobody saying things like 'Kaka to Beckham', 'Beckham to Pirlo', 'Pirlo to Ronaldinho'?" This was the last straw for the big brother, who nearly busted a blood vessel when he shouted in a fit of rage "BECAUSE THAT'S A COMMENTATORS JOB - YOU ONLY GET THEM ON TV!" News has reached me just this morning that an astounding 1200 people turned up at an 1859 Revival themed church service in Connor at the weekend - the building was bursting at the seams and no room anywhere for car parking. I know that some of you readers are based in mid-Antrim - I'd appreciate more detail form any of you! As I've blogged before, Connor was a highly significant location back in 1859. Great news! More info about the local events here - there are many more happening Provincewide throughout the year. "...I have no use for cranks who despise music, because it is a gift of God. Music drives away the Devil and makes people happy; they forget thereby all wrath, unchastity, arrogance and the like. Next after theology, I give to music the highest place and the greatest honour..."
"I'm not finished learning about our church music. In my ignorance I didn't know about the Covenanters. There wasn't much Scottish history taught in my school. It was all Henry VIII and Good Queen Bess." So says Scottish folk music icon Phil Cunningham, during an interview to promote a two-part tv series he's presenting called "Grace Notes", which starts on BBC2 on 14 Feb. It's a short history of Scottish religious music. Let's see if the Prods and Presbyterians get a fair crack of the whip - I'll be surprised and delighted if any of the many Scots language evangelical hymnwriters like Seth Sykes or Alexander Halliday get a mention. 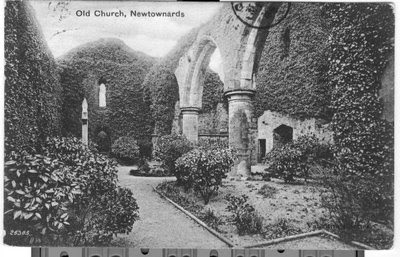 For the first 30-odd years of my life I travelled past Newtownards Priory twice a day, either in a car or an Ulsterbus, but never knowing anything of its historic and cultural significance. It was just another old building, a bit of a wreck, no obvious signage outside it for many years and no way of getting into it either. All in all, it was an irrelevance. • it's an Anglo-Norman building, probably built by the Savages in 1244. It was one of the very earliest stone-built buildings in the Ards. Its Prior surrendered it back to the Crown in 1541 (then valued at 13 shillings and 3 pence! ), who then in turn granted it to Sir Thomas Smith in 1572. • the local landowner/land claimant in 1572 was Sir Brian O'Neill. He discovered that the English army was on its way to take over the land he believed to be his, because Queen Elizabeth had granted the land to her Secretary of State Sir Thomas Smith. Realising they would need strong buildings to garrison the troops, O'Neill burned down all of the abbeys in the area, and probably his own castle (a tower house) which was nearby. • the Priory lay in a ruined and disused state until May 1606, when Hugh Montgomery arrived from Ayrshire with boatloads of Lowland Scots. He had struck a deal with Brian O'Neill's grandson Con - the result of which was that Montgomery got 1/3 of the O'Neill estate. James Hamilton and Con himself got the other two thirds. • when they got off the boats at Donaghadee and did a scouting mission, the Scottish settlers found "...In the springtime of 1606, those parishes were now more wasted than America (when the Spaniards landed there)... for in all those three parishes aforesaid, 30 cabins could not be found, nor any stone walls, but ruined roofless churches, and a few vaults at Gray Abbey, and a stump of an old castle in Newton, in each of which some Gentlemen sheltered themselves at their first coming over...” (from the Montgomery Manuscripts). The Priory was one of these "ruined roofless churches". • In 1607, Montgomery began the restoration project. There's a datestone inside the Priory with the year 1607 on it. • before winter of 1607, the Priory had been restored and "it was made decently serviceable". • Montgomery's younger brother George was at this stage Bishop of Derry Raphoe and Clogher, so he may well have given some advice on the restoration project - he was probably doing similar work himself in the west of Ulster. Adjacent priory buildings, and the old O'Neill "stump of a castle" were also restored as residences for the Montgomeries and their workers. • a report in 1611 said "...Sir Hugh Montgomery, Knight, hath repayred part of the abbey of Newtone for his owne dwelling, and made a good towne of a hundred houses or there aboutes, all peopled with Scottes.."
• Montgomery established a choir for the Priory, and it may well have been the first church in Ulster which witnessed the preaching of John McClelland (he went on to become one of the four Eagle Wing minister). 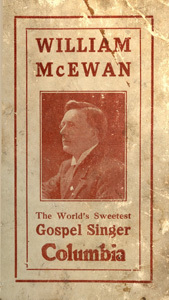 McClelland was also the headmaster at Montgomery's classics school in Newtownards. • Montgomery died in May 1636, and was buried inside the Priory in what was more or less a State funeral, with many nobles and lords from Ulster and Scotland in attendance. The funeral was 8 September 1636, and the emigrant ship Eagle Wing - the first ship to try to sail from Ulster to America - sailed from nearby Groomsport the very next morning. • In 1988, parts of the building were restored by the Environment & Heritage Service. They painstakingly reproduced the ornate doorway, not on the tower of the building, but at a second entrance. Sadly they didn't reinstate the two Bible texts. Newtownards Priory is one of the great physical examples of the impact of the Ulster-Scots, of the skill and vision that they brought to the province. Perhaps the story of the Priory, and the other first Ulster-Scots churches, are deserving of a project in their own right.